Amarilla Spracklin Barclay was most likely born near Blairstown in Benton County in the state of Iowa on the 17 of November 1858. Amarilla’s father was Daniel D. Spracklin and her mother was Elizabeth Keller. Daniel and Elizabeth married 1 January 1853 in Sparta, So. Bloomfield Twp., Morrow Co., Ohio. Source: Marriage Records, 1848-1951, Index 1848-1948, Morrow Co., Ohio. General Index V1A-10, 1848-1948 #388779 Item 1, Marriages v. 1A #388779 Item 2 1848-1858. Keller, Elizabeth to Daniel Spracklin Vol. 1A, pg. 119. Pg. 60, Spracklin, Daniel D. to Keller, Elizabeth on Jan. 1, 1853 by Joel Abbott JP. I believe Amarilla was born near Blairstown because her father Daniel had land in Leroy Twp., Benton County, Iowa which is where Blairstown is located. He had migrated from Ohio to Iowa. According to the 1856 Iowa State census they were in Iowa by 1855. There are problems with the index of the 1856 census but Daniel is there along with other interesting discoveries. The two towns are about 9 miles from each other with Blairstown being directly north of Marengo. I drove the highway between the two towns and it is a nice drive through a canyon and over a hilly area. 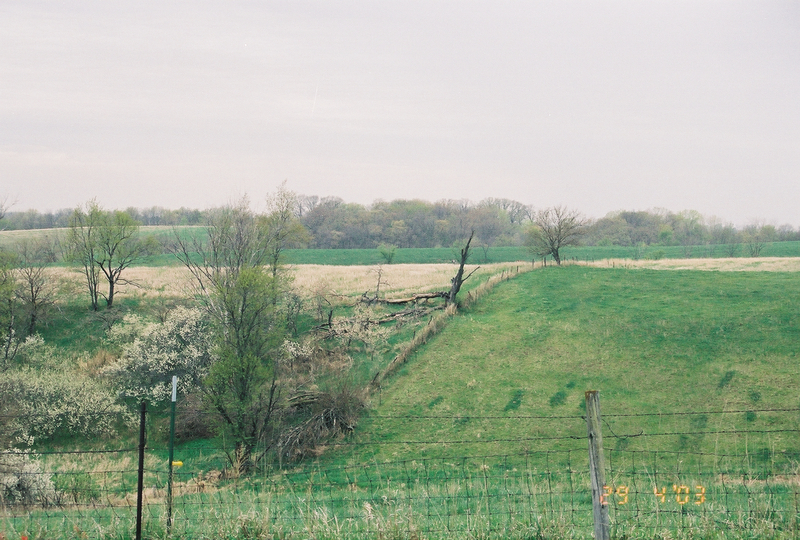 Blairstown and Marengo are situated in flat land areas between these rolling hills. In the photograph above you see Blairstown in the distance and the water tower to the left. Source: Blairstown, 1862 to 1987, History – Town History. I obtained a copy of this history book from the Blairstown Public Library which has a genealogical collection. At that time they were in a temporary building in 2003 so researching was a challenge. The librarian was very helpful. The genealogical collection is in the care of another individual through the Benton County Genealogical Society and that information is listed at the library website. Apparently they are in their new building now, so it would be a much better experience to do research there. Daniel’s land in Leroy Twp. is in two 40 acre sections straddling the double line that runs the entire page above, north to south. He is slightly to the right of the middle of this picture. If you click on the photo it will enlarge and look for two smudgy dots on each side of that long line. 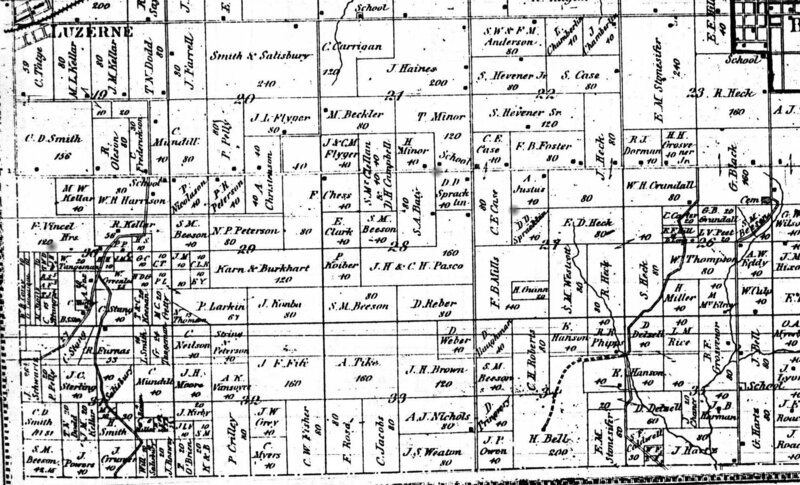 The township page above is from the 1872 Iowa County Atlas – Benton County, Leroy Twp. which I found at the Iowa County Genealogical Society. Blairstown is in the upper right corner of the photograph. Be advised that the Iowa County Genealogical Society was in the basement of the Marengo Public Library but they did some renovations a few years ago and the society is now in North English. See the links to the right on this blog. 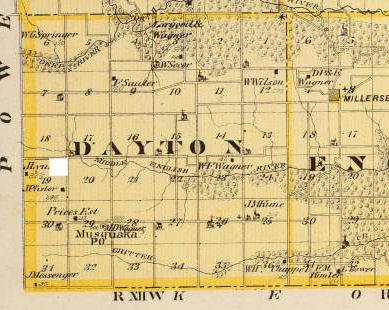 Daniel moved to Dayton Twp., Iowa County, Iowa after this 1872 date and he appears in the 1874 Atlas of Iowa County, Iowa published by Harrison & Warner. Daniel purchased the land in Dayton Twp. at the end of 1872. The land in Dayton Township is in the northeast corner of section 19 which is right next to the Poweshiek County line southwest of Millersburg and close to Keokuk County. Marengo is twenty miles north of Millersburg. So Daniel put some distance between his original land purchases in Benton County and moved south to Iowa County and obtained a lot more land, all in one large piece. To get a better idea of the distance from Blairstown I have below a copy of an atlas page of Iowa County showing Dayton Twp. and if you focus on the white square you can see about where the land was situated. I am using Millersburg as a reference point. I found this atlas at the Iowa Digital Library website for The University of Iowa and I chose the page for Iowa County. http://digital.lib.uiowa.edu/cdm4/browse.php?CISOROOT=/atlases There are more counties listed at this website. 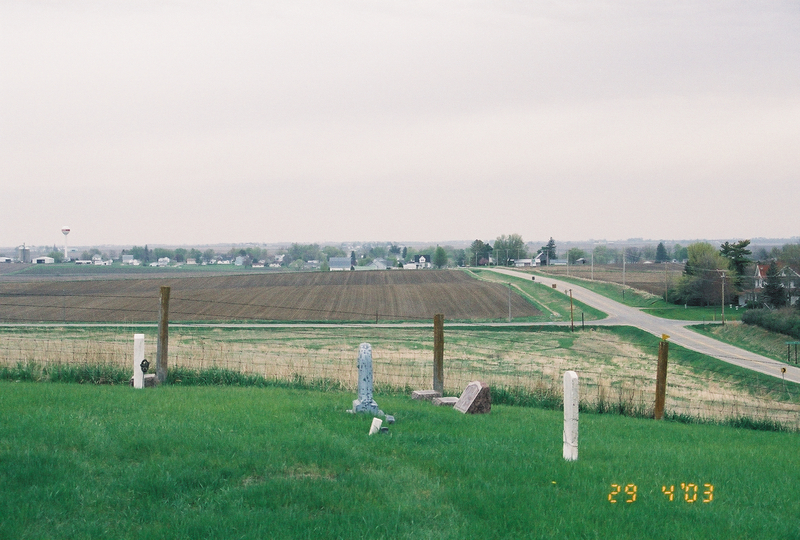 I have deeds and more information regarding Daniel’s land holdings in Iowa and copies of atlas pages for Iowa County and Benton County. I did check newspapers around the time of Amarilla’s birth to see if I could find an announcement or discover her mother Elizabeth’s obituary for March 10, 1859 but I was not successful. I did see obituaries but mostly news about the farming industry. I also checked the bible records at the Iowa Historical Society in Des Moines and did not find anything to confirm my theory. Amarilla’s mother Elizabeth died four months after her birth. Daniel her father remarried in 1863 to Sarah Blacketer Allgood. They had seven more children as I have mentioned in a past post. Amarilla was born in Iowa and was not unfamiliar with living on a farm and that lifestyle. So in my opinion this made her adapt well to life on the frontier in Pine River, Minnesota in 1878 after her marriage to George Angus Barclay. Amarilla’s family the Spracklins is a very large family and I have been researching them for many years. There are many others who have done a great deal of work on this family line. There is Mayflower and DAR (Daughters of the American Revolution) connections in Amarilla’s ancestry through both her father and her mother sides and it spans the early history of our country and if I shared all of the research that I have on her family it would take a blog all by itself and it would be a major undertaking. The scope and focus of this blog about the Barclay’s is about George and Amarilla’s life together. In future posts Amarilla will be touched by her Spracklin and Keller families as events unfold in her life.